IpeDeckingSource is dedicated in ensuring that our mills adhere to the strict guidelines for responsible forestry management set forth by the Brazilian Government and IBAMA. Because we contract from a few select mills, instead of purchasing in the open market, we're able to maintain tighter control on where logs are being sourced and the activity surrounding sustainable forestry practices. Ipe decking and other tropical wood species originating from Brasil are harvested under strict guidelines from IBAMA. 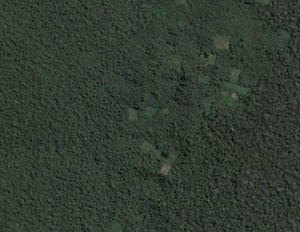 IBAMA is the Federal governing body over agriculture and forestry in the country of Brasil. 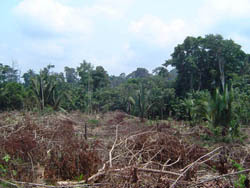 One of their responsibilities is to enforce the management and environmental impact of logging. Timber companies must submit project plans and approved projects will receive permits to log certain species only in specific regions. These projects include information on what specie, tree size, and total volume in targeted logging areas for harvest. Once a permit is issued, the timber company is authorized to take only what is approved by IBAMA relative to the permit. In this scenario, a paper trail is created from forest to finished product to export per timber company. 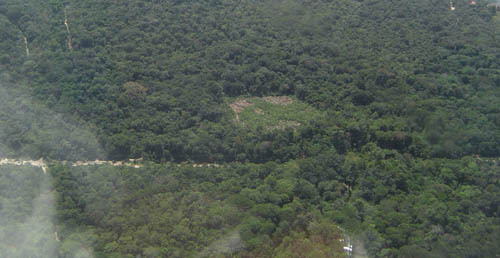 This aerial photo depicts a selective cutting project where a concentration of logs were taken in a specifice area. forest in the background remains. Aerial photo taken to illustrate selective cutting areas.